Why some home improvements should be left for a professional. Concrete acid staining is the new trend to improve their basements for homeowners with concrete floors. Many homeowners are trying to take on the project themselves as a DIY project and this can be one of the most harmful and damaging projects to their health and home out there. While the end result is a decorative piece that is an asset and focal point to your home, undertaking the project can have long-term hazards if you don’t know what you’re doing. There are two direct ways of acid staining concrete: do it yourself or have it done by a professional company. Even if the homeowner has done acid staining treatment to their home already and want it redone to look like a new design color, there is a special preparation machine that will literally strip off a small later of concrete so that the staining can begin correctly. The machine is only owned by companies that specialize in this. There are only 75 of them in the country and they are unique due to their diamond cutting blades. Produced in Canada, they have the power and technology to strip the smallest layer of concrete off the floor surface. This process helps prepare the surface before acid staining to eliminate residue from before the process so the process and result doesn’t end up a mess. Homeowners, performing DIY concrete acid staining requires tools, precision and patience. The best way to understand how to acid stain concrete is to simply research it and grasp how it works and what the acid does. When determining which kind of concrete, it is important to know what may damage it or make the project turn out well resulting in having it redone by a professional that will cost more money. The most harmful part for homeowners that are doing this themselves is the unknown acidity and reactions of the products. The acidity of the acid can be detrimental if it touched anything that can be damaged by the acid. From here, homeowners must fathom the process of acid staining their own floor and have already planned what to do if something goes wrong and the costs of messing up and needing it to be redone by a professional. Professionally staining concrete floors with acid, the process can be quite simply said, “they know what they are doing, therefore, nothing to worry about”. In other words, they know exactly what they are doing! Unless homeowners are keen on what they are doing with acid staining concrete and understand the process, it is more worth their money to let a professional who has done it for many years, like Concrete Restoration Systems, do it themselves so that it can be done to the homeowner’s expectation, and best of all, both parties with in this instance. With concrete staining professionally done, there comes benefits, too. Upon completion, the concrete floors will be sustainable to damage and only require easy care for the future. Due to their polished feel and look, it just takes a broom, vacuum or other cleaning supplies to clean up a spill. It has been said that a concrete floor that has been beautifully transformed through acid staining will last up to a century, whereas carpet must be cleaned every other year costing money and replaced once or twice in a decade. One of the best benefits of concrete acid staining is the versatile look, specifically an industrial look. 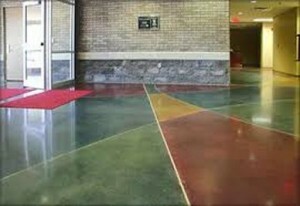 Concrete can be given certain stains that will make it look dry instead of a wet look, which some people may not like. With a dry appearance, it may look more welcoming and homey. 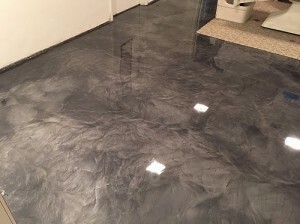 Homeowners, if acid staining your concrete floors has been a dream of a lifetime, give Concrete Restoration Systems a call today and they will give you the best buck for your budget. With nearly 40 years in the industry and unbeatable high quality machinery, they will have it done it no time with a beautiful look to last for years. Serving Colorado for nearly 40 years, Concrete Restoration Systems has the experience and tools to make your dream home into a dream come true. Unlike other companies, they understand that taking the time to treat the concrete floor properly with acid yields perfect results. They appreciate the process and what makes acid staining such a beautiful piece of work.